Welcome to the University of Salford (UK) Occupational Therapy blog. Take a look around and you will see current issues discussed, pages for those who want to know more about the profession and external links to a range of relevant and useful places. I hope you enjoy your visit, please feel free to comment on posts or contact us with your own ideas. Disclaimer: The opinions expressed in this blog are entirely our own and not necessarily those of our employer or any other occupational therapist. People know that by eating more fruit and veg portions and by going to the gym we can choose to lead healthier lives. However, taking steps to live a happier, more balanced life seems a much tougher prospect. This problem inspired Angela Hook and Sarah Bodell, senior Lecturers in occupational therapy at the University, to develop Occubuzz. Part of Angela and Sarah’s day job is to help people analyse all the different things they do in their daily lives and find the right balance. Their aim is to ensure patients can do everything that needs to be done in their lives, and do what they want to do - without guilt. However, with the pressures of modern living not everyone has the time to visit experts like Sarah and Angela. Occubuzz is their way of giving everyone their very own occupational therapist, available at the swipe of a screen. Occubuzz is based on the principles of occupational science and is entirely evidence based. The free app comprises a short self-assessment quiz that helps the user identify their current work and home life balance. At the end of the quiz the user will be provided with immediate personalised tips as to how to improve their wellbeing. After that, users can record and rate their chosen activities every day. Occubuzz tracks the user’s feelings as they carry out their daily activities - and that doesn’t just mean work: it can be picking the kids up from school, doing the laundry or going for a run. The app then uses this data to give the user an informed overview of what they are doing on a day-to-day basis and identifies what activities are making them feel better or worse. The information given by Occubuzz puts the user in the driver’s seat, allowing people to better organise their time by striking a balance between what they have to do and what they want to do in their work and home life. Armed with the facts about their day to day lives, users are able to change or cut down on activities which are getting them down and improve their overall wellbeing. 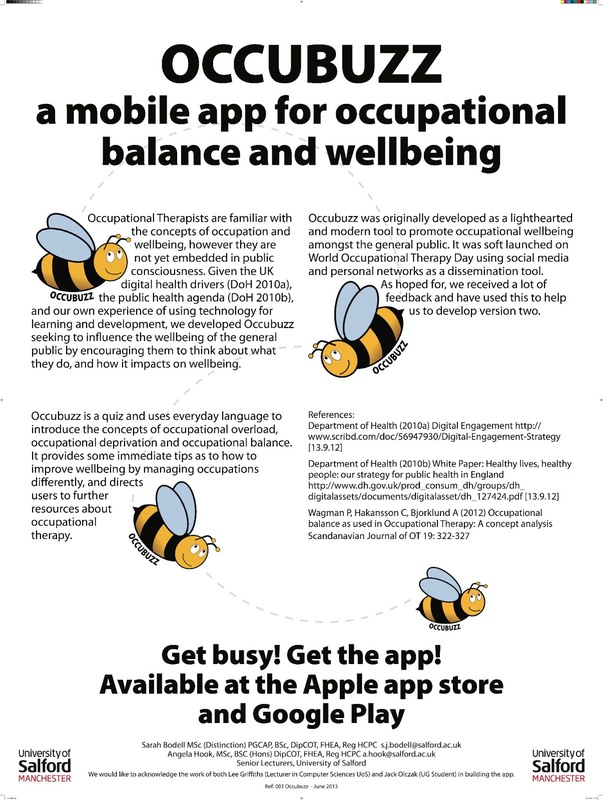 Download the Occubuzz app ( for free) from your App Store. Use it for a while and then let us know what you think. We'd love to know how you got on with it. Tell your friends and make sure you join us on Facebook to share experiences and create a " buzz". Want to find out what we've been up to? Our newsletter for spring 2016 is now available. Check out what we have been up to over the last few months.